We're in the thick of it at Jupiter now! Since early on Saturday, February 24, New Horizons has been executing its Jupiter close approach sequence, which contains 15 to 20 observations per day. Recall this is almost 10 times more than what we were doing just a week earlier! Here on the ground we aren't yet seeing much science data, but the engineering data we're getting shows the encounter is progressing nominally and the various observations are coming off right on schedule. What's next? Today, we're studying atmospheric composition and structure of both Io and Callisto, mapping the surface compositions of Ganymede and Europa, searching for embedded moonlets in Jupiter's rings, obtaining high-resolution images of the Little Red Spot on Jupiter, imaging Io's volcanic plumes, and obtaining ring images to study the phase-angle behavior of their dust. We're also sending home eight hours of downlink data. All the while, we're studying Jupiter's magnetosphere. By late tomorrow we'll be at closest approach, but there are still twice as many observations tomorrow as we're making today! Before I close for today, I was recently asked to say something about what became of the now-derelict Boeing STAR-48 upper stage that boosted us onto our Jupiter trajectory. Well, the last anyone saw of it was on launch day, January 19, 2006. As a result, its trajectory isn't nearly as well known as the path of New Horizons, but we do know it will make its closest approach to Jupiter on Tuesday, February 27, about six or so hours before New Horizons does. Moreover, we know that our upper stage is headed to an aim point almost half a million kilometers farther from Jupiter than New Horizons. As a result of these "errors" in its trajectory, our third stage will miss Pluto in 2015 by about 200 million kilometers — which is about as far as the average distance from the Sun to Mars! I'll be back with more news and views soon. Keep exploring, as we do! 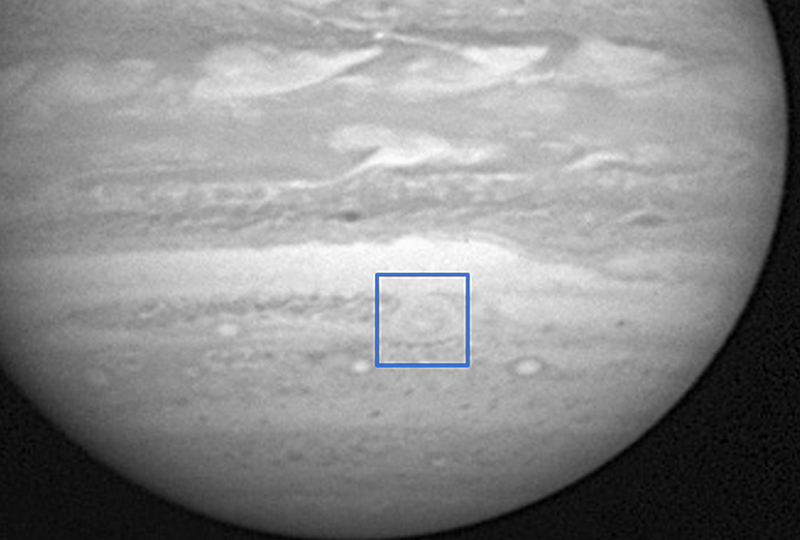 Jupiter's Little Red Spot - a nascent storm marked by the blue box in this New Horizons image taken last month - is among the New Horizons observation targets during this week's close approach sequence. During the Jupiter encounter, you'll also be able to read Alan Stern's blog on the Astronomy magazine Web site; check out http://www.astronomy.com for details.